It's Legislative Election Day here in Indonesia! You know that there are two parties, right? The Democrats and the Republicans. 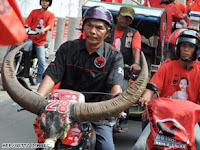 Here in good old Indonesia, there are more than 30 parties, categorized by trees, paddies, bulls, religion and occupation. We have the businessman's party, the laborer's party, the patriotic people's party (infamous for its hooligan-ish cadres and members), democratic, socialist, people's conscience, people's movement, people's awareness, people's faith and whatnot's parties. I don't know if having 30+ parties is better than having just one party to choose from: the ruling president's party, like back in the times of Soeharto's dictatorial regime. Voting can cast a person his life. . The voting sheet is usually bigger than the voting booth. Maybe even bigger than the voter? The voting sheets prepared are less than the number of citizens of voting age. Having less voting sheets than citizens isn't that bad since there are more non-voters than voters in the entire country. Since it's Easter tomorrow, you probably want to cross out all Christian ballots (nearly ten percent of the population). The biggest revenue from the elections goes to the press and campaign material printing companies. You can sell your vote to the highest bidder. You can be underage, fictitious, dead or otherwise ineligible to cast ballots. Indonesia is a good example to a country that is not ready for absolute democracy. The Public Opinion states: "Whatever results this election is going to come out with, whether or not you've voted, you're screwed either ways. It's not like anything is going to change for your behalf anyways".